HKR is from Tsuyama City, Okayama, and signed to the PartyGunPaul label. He began playing in his hometown of Tsunami City, Okayama in 2000 as part of the 2 MC unit WORD TRICK with his older bother ACE. 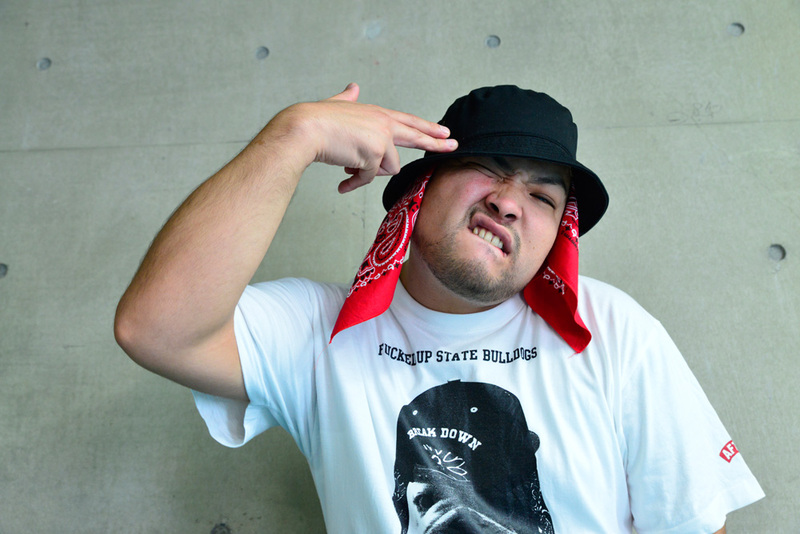 He was also a member of Tsuyama’s legendary FAT BOX crew, which would later become the PartyGunPaul label, and right from the start gave impressive performances, earning a reputation as a talented rapper around the country. As part of WORD TRICK, HKR released lots of material and played many shows, but decided to begin a solo career in 2013. He participated in DJ RYOW’s “DON’T STOP Remix” contest with his friends BAZ-K and LAMEN-DOGG, and won it. At the end of the same year HKR released “WHO SHOT YA?”, which was produced and mixed by DJ KAJI. Using the Twitter hashtag #KDOS (King of dope stage/Kore de dame nara ore ga shinu), the song was remixed by artists all over the country and became a popular topic of conversation. HKR is a truly a phantasmagoric rap monster able to adapt his voice and staging to any location and present himself as fully as possible. He broke an extended silence in 2015, so look out for info in the near future! “Legend of Phay Second” released on the Bull’s Entertainment label.